Basic ingredients: The expanding River Cottage HQ’s latest venture is all about giving career-minded cooks a step-up the culinary ladder. The range of programmes are designed to suit ambitious and mainly younger chefs of various skill sets. The Young Chef Apprenticeship Scheme is a free twelve-month course involving twenty-four training days, experience at high-end restaurants in the South-West and in-business tutorials. Those between 16-24 and unemployed school leavers who succeed gain a professional cookery level 2 apprenticeship. Meanwhile, the Level 2 Professional Cookery Qualification comprises a combination of workshops, in-business training and in-business assessment; it costs £1500 and is tailored typically to the commis chef looking to enhance their skills. For sous chefs, the advanced, level 3 programme does the same at a higher cost of £2000. The former focuses on developing broader culinary capabilities such as butchery, pastry and sauces, whilst the latter emphasises execution of complex dishes. The City & Guilds, one-day accredited courses are hands-on workshops, priced at either £180 or £230, that help cooks brush-up on anything from Fish and Game to Sustainability and Essential Eating. Another freebie for 16-18 year olds who are not in government-funded education or full-time employment, is the three-month Traineeship Programme. In fact, the school’s dedication to developing budding young chefs is such that they reward “the country’s most ambitious and inspiring young foodie” with a Rising Star accolade and a year learning tricks of the trade at River Cottage HQ. They say: Chefs’ School launched in spring 2013 with the primary objective of delivering qualifications and accredited training that embody the River Cottage food values. There are a range of programmes and courses available for learners of all levels of ambition and competence. 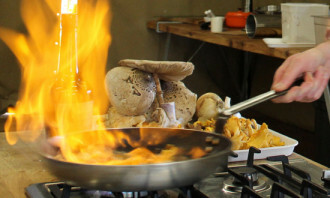 We say: This is a school for budding chefs, which is run by chefs and advocated by chefs. Angela Hartnett has highlighted the infectious enthusiasm of the team and their ability to teach the true value of provenance in food. Contact: River Cottage Chef’s School, River Cottage HQ, Park Farm, Trinity Hill Road, Axminster, EX13 8TB.